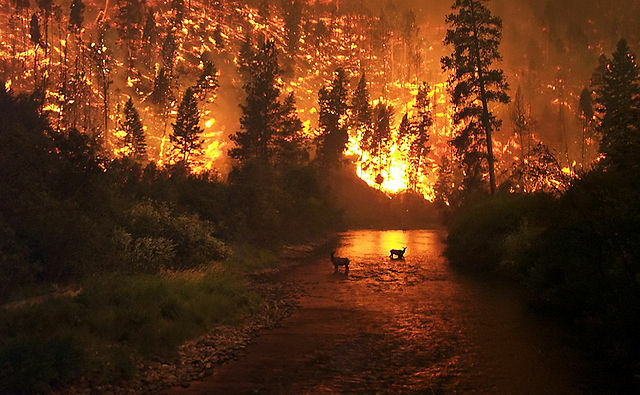 Deer and wildfire, Montana: John McColgan, USFS, via Wikimedia Commons. 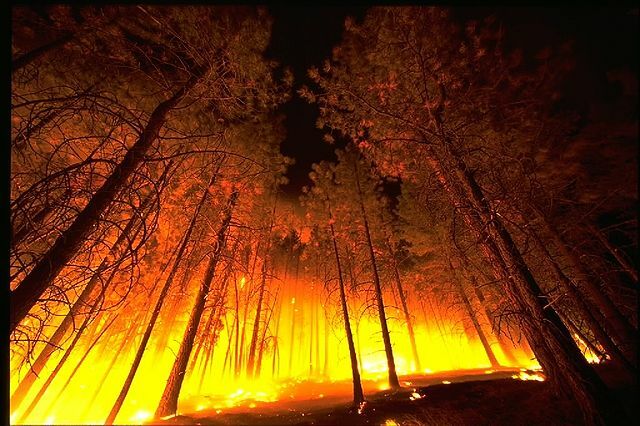 The western US has suffered an increasing number of large wildfires in recent years according to a new paper in PNAS. The causes are droughts, a build-up of combustible fuels—largely from trees dying of heat and insect infestations—plus the spread of fire-prone species. While grazing and fire suppression actually reduced wildfires below normal for most of the last century, combustible biomass rose, along with temperatures and drought. The convergence of these two trends—suppressed fires with more fuel—has now created conditions for a perfect storm of wildfires. Trends in temperature, drought, and population from charcoal, fire scars, historical, tree rings, and archeological data. Click for larger image: Jennifer R. Marlon, et al. PNAS. DOI: 10.1073/pnas.1112839109. The authors based their findings on charcoal in sediments over the past 3,000 years, compared with historical wildfires and fire scars from burned trees. These data showed fewer wildfires in the 20th century than at any time besides the Little Ice Age. Warm dry intervals like the “Medieval Warm Anomaly” between 1,000 and 700 years ago saw more burns. Cool moist intervals like the “Little Ice Age” between 500 and 300 years ago saw fewer burns. 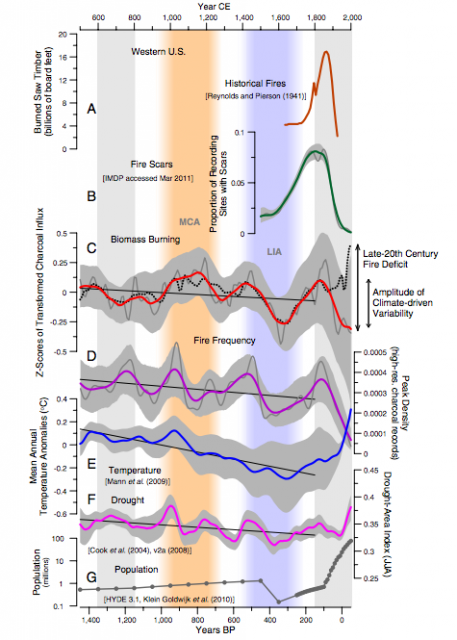 Short-term peaks in fires were associated with abrupt climate changes: warming or cooling. Humans caused fires to shift from their 1,000-year-maximum range to their 1,000-year-minimum range in less than 100 years. Climate acted synergistically with humans to increase fire events sparked by agricultural practices, clearing of forests, logging activity, and railroading. Credit: USDA via Wikimedia Commons. Based on the fire data alone, the levels of burning during the 19th and 20th centuries are not anomalous… When climate is considered however, the past approximately 150 years are remarkably anomalous. Although the current rate of biomass burning is not unusual… it is clearly out of equilibrium with the current climate. Our long-term perspective shows that the magnitude of the 20th century fire decline, while large, was matched by “natural” fire reduction during cold, moist intervals in the past. Current fire exclusion and suppression however, is taking place under conditions that are warmer and drier… which calls into question their long term efficacy. Jennifer R. Marlon, Patrick J. Bartlein, Daniel G. Gavin, Colin J. Long, R. Scott Anderson, Christy E. Briles, Kendrick J. Brown, Daniele Colombarol, Douglas J. Hallett, Mitchell J. Power, Elizabeth A. Scharf, and Megan K. Walsh. Long-term perspective on wildfires in the western US. PNAS. DOI: 10.1073/pnas.1112839109.